“Like an ice-berg, The Tempest seems to hide most of its bulk beneath the surface. The play constantly invites conjecture and amplification, but it is impossible to be sure of the correct answers to most of the questions posed”. 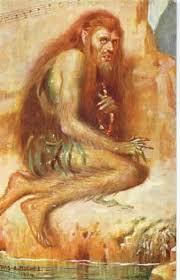 On last week’s Radio 4 programme In Our Time, Melvyn Bragg and his guests, Jonathan Bate, Erin Sullivan, and Katherine Duncan-Jones, managed the considerable feat of discussing The Tempest from many angles in a mere 42 minutes. You probably won’t find a better short introduction to the play, its sources, original meanings and staging, and its modern interpretation. It’s now available as a podcast. Effectively the royal playwright in the Jacobean period, Shakespeare often covered issues that were of special interest to the King. The contributors to the programme looked at issues including the concern that sons and daughters of rulers should make suitable marriages, and the supernatural, which King James was passionately interested in. The play can also be seen as a meditation on the theatre, with Prospero being associated with Shakespeare, or on the ethics of colonisation. Erin Sullivan talked about Montaigne’s Essays in which he talks about ideal methods of government and, of particular relevance to The Tempest, the essay Of the Caniballes. On 18 November 1562, John Hawkins landed on the coast of Africa in an expedition often thought to mark the beginning of the English slave trade. He was “hoping to obtain some negroes”. To begin with he had little success, but he joined forces with a local leader, attacking a town and capturing several hundred people. “Now we had obtained between four and five hundred negroes, wherewith we thought it somewhat reasonable to seek the coast of the West Indies, and there for our negroes we hoped to obtain whereof to countervail our charges with some gains”. Were I in England now, as once I was, and had but this fish painted, not a holiday fool there but would give a piece of silver; there would this monster make a man; any strange beast there makes a man: when they will not give a doit to relieve a lame beggar, they will lay out ten to see a dead Indian. Shakespeare combined these stories of exotic strangers with popular stories of shipwreck. 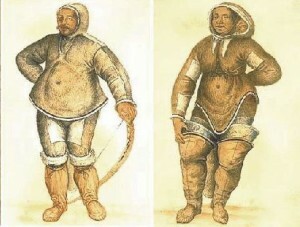 The Sea Venture was wrekced on its way to Virginia in 1609. It was driven towards the Bermudas in a terrifying storm and it was assumed in England that the ship and its crew were lost. A year later it turned out that they had found refuge on an island where they had survived until they were able to set sail again for Virginia. There was huge interest in the story, and the RSC’s website contains a page on the subject that includes a clip from a programme in James Shapiro’s series The King and the Playwright: a Jacobean History. 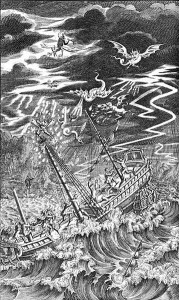 The Tempest is one of Shakespeare’s plays which seem to have performance conditions very much in mind. 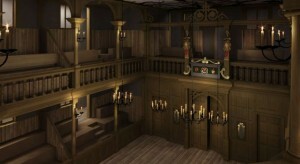 Performances almost certainly took place in The Globe, but it’s known to have been put on at the Banqueting Hall in Whitehall and at the indoor Blackfriars Playhouse. With the Sam Wanamaker Playhouse at the Shakespeare’s Globe complex nearing completion it will be only a question of time before we see this play in something like original conditions. The playhouse is described in an article in the Daily Telegraph. Modern British productions almost always refer to the UK’s colonial past and the history of slavery. In the radio programme Bate mentioned the 1900 production by Beerbohm Tree. Tree unexpectedly took the part of the savage Caliban taking the view that “in his love of music and his affinity with the unseen world, we discern in the soul which inhabits the brutish body of the elemental man the germs of a sense of beauty, the dawn of art”. More recently the 1950 book by Oscar Mannoni, Psychologie de la colonisation began the examination of the mentality of colonisation and racism and greatly influenced the portrayal of Caliban on stage. 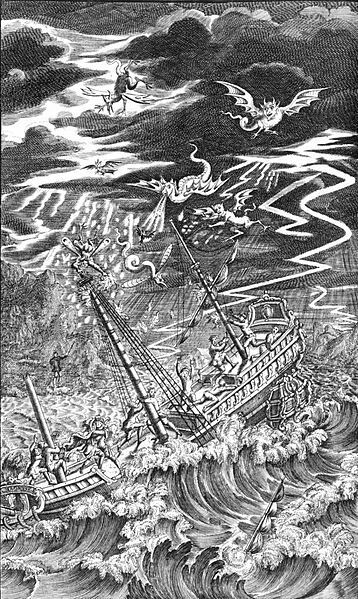 The Tempest has inspired many works of art from notable artists like Hogarth and William Hamilton, the sculptor Eric Gill, composers like Purcell, and popular culture like the films Forbidden Planet and Prospero’s Books. Also in 2012 the Olympics opening ceremony referenced this “strange and compelling play”. In 2012 an episode of the Radio 3 programme Night Waves was devoted to artistic reimaginings of the play, including consideration of many of the questions the play continues to ask. This entry was posted in Legacy, Plays and Poems, Shakespeare on Stage, Shakespeare's World and tagged Anne Barton, Caliban, Erin Sullivan, Herbert Beerbohm Tree, In Our Time, Jonathan Bate, Melvyn Bragg, Montaigne, Night waves, Sam Wanamaker Playhouse, The Tempest. Bookmark the permalink.